Referrals in Google Analytics show you sites that “referred” visitors to your site by clicking a link. This category excludes advertising visits, as well as organic search, in most cases. To view referrals, go to Acquisition > All Traffic > Referrals. Once here, you’ll see a list of the sites that referred traffic to your site, sorted by Session volume. You can see metrics for volume of traffic, engagement, and conversion performance. In evaluating referrals, you’ll want to look at not only how much total traffic (Sessions and New Users) other sites are driving but also how effectively that traffic is adding to engagement on-site. Evaluate Pages/Session and Avg. Session Duration to see how long users are spending on the site and how much content they’re viewing. Finally, look at conversion data to measure how well these sites are contributing to your business goals. 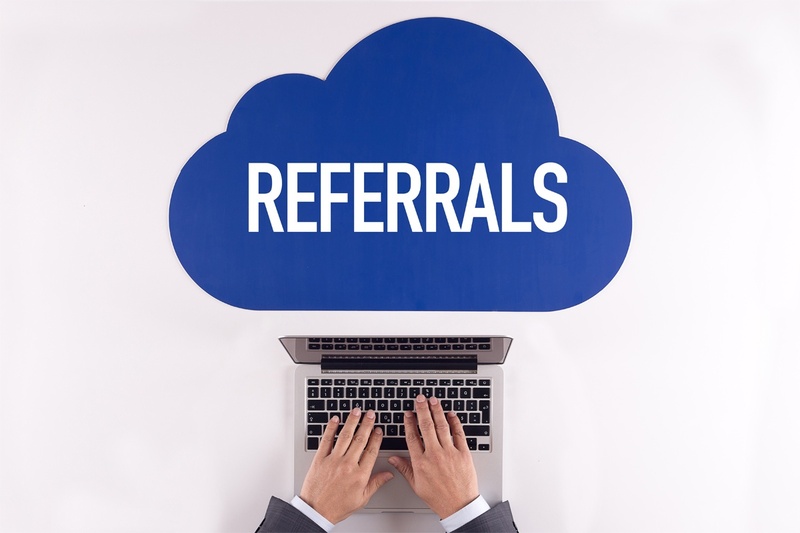 Referral reports can provide a wealth of information about how your online strategies are driving traffic to your site. You can also identify problematic areas in how you’re tracking data. While Google Analytics Social reports offer the best way to aggregate metrics from social media platforms, social traffic should also show up in the Referral report. Here, you can easily compare performance of social sites with that of other sites. For example, you’ll be able to tell if a local directory listing you obtained once is sending more actual traffic than a Twitter account that requires hours of attention every day (this may also be a commentary on your social media engagement strategy, but that’s for another post). You may also see that traffic from the same platform may show up multiple times with slightly different URLs. For instance, in the example we showed, both facebook.com and l.facebook.com appear. The l.facebook.com URL indicates traffic via a link shim, a redirect that involves checking the destination URL’s security. You may also see m.facebook.com, indicating traffic from the mobile version of Facebook’s site. In short, be aware that facebook.com referrals alone don’t show the whole picture of traffic from Facebook. Referral reports can show you how well listings from local directories or business partnerships are contributing to site traffic and conversions. For instance, in our example report, savingscentral.com is the top referrer. This site is dedicated to enhancing a power company’s partnerships with local appliance and HVAC businesses to promote energy-efficient systems. To help users find these energy-efficient businesses, the site links to HVAC companies that qualify, including the one whose analytics report we showed here. Based on the data in this report, savingscentral.com has proven the value of the listing by not only driving the most traffic of any referring site, but also driving seven conversions (contact form submissions). This volume to conversion ratio represents a 6.6% conversion rate, higher than other channels. In addition, we also note Pages/Session and Avg. Session Duration are well above the averages for the site as a whole, which means that the visitors referred from this link are highly engaged users. Next, lennox.com shows traffic from a manufacturer of HVAC equipment that this company installs. This site has been proven to drive the second-highest volume of traffic, as well as a conversions, once again showing value in links from business partnerships. This data can help evaluate which business partnerships are the most useful in terms of sending truly interested visitors. Conversely, it can also show where paid listings are not providing ROI or are sending unqualified traffic. Despite Google Analytics’ usefulness, spam referrals have become a rampant problem, delivering hundreds of fake Sessions and skewing data across reports. The referral report can help you flag these invalid visits to your site, so you can improve your data and ensure you’re viewing the most accurate information possible. In our example, you’ll note floating-share-buttons.com and site2.floating-share-buttons.com in the report, both of which are well-known spam referrals. These represent a total of 107 Sessions to the site, approximately 10% of the total referrals in this timeframe. To view the most accurate data, you’ll want to create a Segment eliminating these referrals while viewing current data, as well as creating a Filter to exclude them moving forward. See more in our article about How to Filter Out Fake Referrals. While you’ll see the majority of organic search traffic in the Source/Medium report as google/organic, some organic traffic will end up falling into the referral report. For instance, see bing.com in our example report. With Bing’s move to search encryption, a portion of Bing search traffic ends up as a bing.com referral vs. a bing/organic visit. You’ll also see some lower volume search engines like DuckDuckGo show up here. You may also see google.com in your referral reports at times. While you may think this represents Google organic traffic, it generally indicates traffic from other properties on Google outside of search. For instance, links in forum posts in Google Groups will result in traffic from the google.com domain. This can help you get a more complete picture of your organic search presence beyond Google. It is also useful if you’ve been expending energy interacting in Google’s forums or other sites. Traffic from other Google sites will not show up as organic search traffic, but rather in the referral reports under the domain google.com. When your PR efforts result in an online publication mentioning your brand, you’ll often obtain a link back to your site. Traffic from these links will show up in your referral reports, allowing you to measure the impact of PR efforts in driving value to your online presence. While PR may may involve offline efforts, Google Analytics can help to connect the dots to online activity. In this example, you can see traffic resulting from multiple Huffington Post domains as a result of a brand being featured in an article there. In total, 682 New Users came directly from this placement. Using the referral report, you can compare the performance of multiple placements on news sites, looking at traffic, engagement, and conversions. Referral reports allow you to measure the impact of social media traffic, PR placements, business listing sites, and other sites linking back to your own. By looking at traffic levels, user engagement, and goal completions, you can determine how well each site contributes to your bottom line. While incoming links bring other kinds of value to a site’s online presence, those sending referral traffic can have a direct and measurable impact on the bottom line. Ultimately, you should tie referral data into your analytics reporting process to identify high-performing referring sites on which to focus future efforts. Using this data you can more easily pinpoint links coming from valuable sites, underperforming sites that show potential and low-quality listings that may not be worthwhile to continue. Take a look at the Referral Traffic widget in Megalytic to quickly and easily show referral report data in your client reports!